UFOs are never tracked on radar and visually, right? Sometimes, it's claimed that UFOs are never tracked on radar, so they couldn't possibly be physical objects flying in controlled airspace. However, there are many cases on record (a few that I've blogged about here) in which unidentified returns were observed by radar operators. The next issue is, of course, whether anything was seen both visually and tracked on radar, and the number of these cases is far less. Yet, a few do crop up now and then. In my slow and agonizing (trust me) perusal of the NRC Canadian UFO files, I'm finding some curious reports, and I'll be detailing them periodically in future blog entries. One case that caught my eye was a report from 1972, involving an object tracked on radar by tower operators at North Bay, Ontario, where NORAD is based. What's interesting is that many other cases on file consist of several pages worth of correspondence and discussion, even when there's an obvious explanation for the object seen. In this case, however, there's no indication that the UFO report was ever investigated or followed up, at least at the low level of classification of which we have access. In fact, that in itself suggests that the case must have been referred to a higher-level investigation. Anyway, the report notes simply that on September 10, 1972, at 0317Z (10:17 pm ET on September 9, 1972), "Mr. Robert Patterson," an Air Traffic Controller, and "Mr. Stacey (? )," the Radar Operator at North Bay Airport, both observed "one object flashing red and green lights, speed very slow to 300K [knots] at 4000 to 6000 feet estimated." Visual sighting correlated with a North Bay terminal radar return at 340 degrees, six miles. Object appeared to turn in tight circles or hover for approx. 15 minutes and then lose altitude steadily with flashing lights becoming dimmer until visual contact lost at 0345Z. Radar contact lost prior to visual contact. My check with a sky chart program shows that Jupiter was the only planet in the sky at the time, and it was low on the horizon, but in the southwest, not at 340 degrees. Now, the fact that the report is careful to call the witnesses "Mr." means they were civilian, and not military personnel at NORAD, but working at the civilian airport. Since this doesn't seem to have been a misidentified star or planet, it could have been a military aircraft for which the civilians were not entitled to know about. Still, we don't know what it really was because there was no follow up at all. And we're left with a UFO seen by reliable observers and tracked simultaneously by radar. On August 30, 2011, during the evening over Geary, NB, a Canadian Army witness and his wife saw a "bright light travelling across the sky, with no sound or strobing lights like most aircraft." As for an old case, I found in the National Archives files a report from October 5, 1970. At about 5:10 am local, radar control operators at Shearwater, NS, had been hearing radio reports of UFOs seen in the area. They were surprised to find a "good radar return" of a stationary object southeast of their position. their "precision radar" painted the UFO at 2500 feet and was observed for 10 minutes. Why did the observation end? Because "the controller discontinued surveillance to prepare for an aircraft recovery," and he also "did not take his sighting seriously." Yes, the military radar operator detected an unidentified target but didn't think it was worth bothering about. Only after he heard about "similar sightings" on commercial civilian radio did he file his official report. 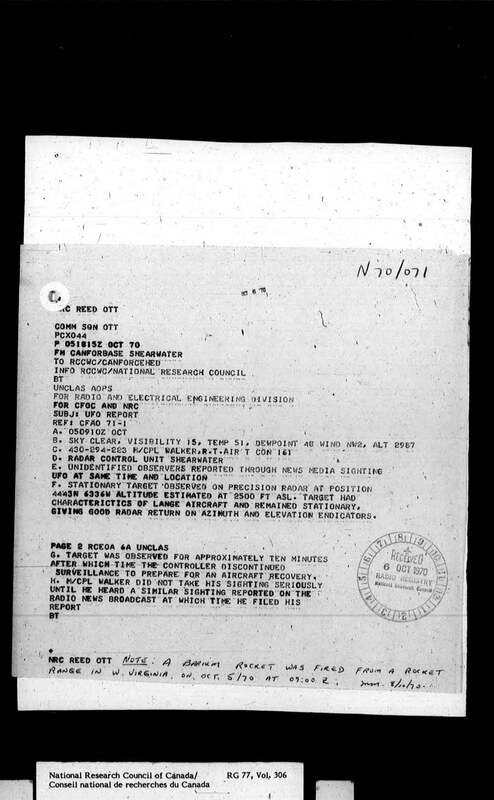 Beyond the radar operator's personal view, a note at the bottom of the official report notes: "A barium rocket was fired from a rocket range in W. Virginia on Oct. 5/70 at 09:00Z." Thus, according to the NRC, the radar return was unexplained. Except that a barium cloud 150 miles up in the atmosphere wouldn't give a "good radar return" of 2500 feet. Visually, sure, that would explain the UFOs, but not the radar observation, unless we assume that a "precision" instrument that routinely vectored military aircraft safely could be so badly miscalibrated or misread.